Welcome to Beach Haven! This peaceful home is one of only a handful in Arch Cape with its own private beach access. Add a beautifully manicured yard and garden, a porch that can be used in the midst of a rain storm and a wall of windows that frame stunning views of the Pacific and you have discovered the true meaning of tranquility. Once you step inside the gate, you will feel secluded from the outside world. Let the sound of the waves wash over you as you wander through the garden with its three separate and unique seating areas. Let this mid-century modern home welcome you. You will find the first of four bedrooms just off the entry. This room overlooks the front yard and has a queen-sized bed and en suite bathroom. Walk a little farther and you will find the master bedroom. Ocean views from this room will entrance you from the moment you enter. There is also a full en suite bathroom and queen-sized bed. You will appreciate the bones of the mid-century charmer as you step into the open living and dining rooms. This professionally-designed space provides ample seating for friends and family. There is a large brick walled, wood- burning fireplace for those cooler evenings. There is also a cozy seating area next to the windows that is the perfect spot to enjoy a cup of tea while watching the ever-changing waves. 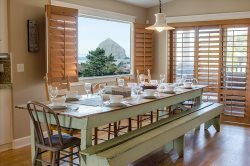 The uncompromising views of the Pacific continue as you proceed to the dining room. There is a large dining table perfect for family meals. Next to the windows, you will also find a delightfully charming child’s craft or dining table. The kitchen is fully equipped and well laid out. The bright blue counters are in keeping with the mid-century modern feel. Finishing off the first floor is a half bath with a full-sized washer and dryer. Walk upstairs and you will find a second full bathroom and two more bedrooms. The first bedroom will delight the young at heart with two twin beds and vaulted ceiling. The home's fourth bedroom is one the most enchanting areas of this home. The queen-sized bed backs to windows filled with ocean views that are hard to match. Wander back down the stairs and off the living room to the covered porch. This area has a dining table, bench seating and a fire pit. Imagine siting under the roof of the porch and watching winter storms in this sheltered space. There is a grassy area for enjoying yard games or letting the children run. The private beach stairs will have your toes in the sand with just 36 steps. Let this home and its coveted beachfront location in Arch Cape become an integral part of your family’s beach tradition. The staff was very helpful during the months leading up to our stay. We all felt very welcomed and knew we could call upon the office if we had any concerns or questions. Everyone I had contact with at your company (especially John) was very accommodating and friendly. I appreciated your company honoring the reservation and payment I had already made to Starfish before the transfer of the property to you. From the pictures on the listing, we had our hearts set on this property due to the privacy and direct access to the beach for the kids, etc.